Are you are looking for a single & secure window, Lex Mantra is a perfect solution to optimize your company’s legal operations. With full-featured litigation management software, we smartly provide mutual detailing right from preventive management, contact matter management to conclusion and results via uncomplicated inputs & reporting. In corporate sector, large numbers of actions are taken against them or many quench at the stage of notice or complaint. Many times such scenario takes place because corporate does not want to engage in unnecessary litigations and step towards closing the matters as soon as possible. This makes them respond to such cases that are in limelight. If notice need to be issued it can be easily done with the help of features like "LIBRARY", where you can easily save and manage your documents. Matter management is one of the most inclusive module of Lex Mantra where detaining related to case is recorded. It helps users to have hassle-free feeding & planning of current updated and upcoming plan of action. Sequences of events get recorded in an appropriate manner. Matter related record of responsible person is updated with accomplished history of the case. Matter management software helps you in identifying matters that are drowned at the early stage with the assistance of its employees. Reporting is done generating the status of Pending Notices, Close Notices, Yet to respond and more. Case management software features are user-friendly. Come with simple input, they easily generate informative reports. Reporting of legal department of a corporate company can be done at a single click. 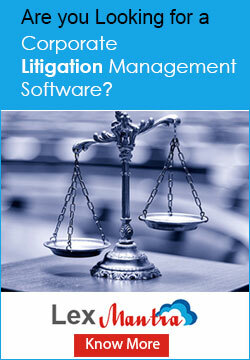 Its a case management software . Does it provide at a glance that what stage all cases of a corporate are and what is the exposure ? Is it a cloud based solution ?